Have you ever made a purchase of beads, findings...even a tool and then asked yourself....WHY did I buy this? What do I do with this? At B'sue Boutiques, we are always happy to help with that question, if we can! And we usually can, because B'sue uses the stuff she sells. I don't feel I can do you any service carrying things I don't have a clue about. That's why, for example, I stopped selling soldering kits. Until I knuckle down and take a class from Sally Jean Alexander someday at Art and Soul (and if you get a chance, you should! because she's the IT girl for soldering with a wand) I've decided, nope. I sold out what I had at half off six months ago and reinvested in things you'd like and that I knew something about beyond how to open the package and plug in the wand. Since there are only twenty four hours in a day, I can't always respond in depth as much as I'd like. BUT ASK. It could be what you are asking, many others are, and it will prompt me to do a video....which is always the best way, most people learn best by being SHOWN. I'm always up for ideas for videos. So send them! Or come to my Facebook page at B'sue Boutiques and comment, hey what about this, or how do you do that? Because when I respond to you THERE, any number of people will see it, and also benefit. But always ask! Ask and you shall receive....as you see, in the photo below, I figured out what to do with it! Adding Pearls and Stones to Your Painted Collage Pieces Check out the necklace I'm wearing! Come on over and visit with us in the Messy Workshop! A couple of weeks ago I posted an instructional video at YouTube on colorizing/painting cuff bracelets. I painted a BUNCH of the bracelets Honeysuckle pink! As you can see, I've added something to the center. What IS that? It's a 30mm bezel that I painted inside with Lumieres, then Diamond Glazed, and then added glitter and art shards. When it dried, I mounted the bezel in a prong mount to give it a finished look....then glued it to the middle of the flower. I believe I showed you how I did this in the video listed above, as well. Maybe we should have a whole video devoted on how you can make your own cool focals under Art Bubbles? I just got my Cuttlebug machine this week.....and I'm in love! Not only does it work with paper, but you can emboss MICA sheet....and METAL! Last Friday, Rob and did a video so that I could personally SHOW you all the neat things you can do with this little machine, which retails in the 65-70.00 range. Grab a cuppa, and come on over to the Messy Workshop and play with us! I also light up my little torch and patina some copper sheet! Can you flick a BIC? Then you can patina copper sheet. I'll show you how! Here's a fab mixed media piece from our pal, Hilary Frye of Fryestyle. She did it as an Honorary Design Team member Melanie Brooks' Earthenwood Studio this month. Five of the ceramic charms are from Melanie's collection. Hilary does a fabulous job of pairing hard with soft in her mixed media designs: she loves jewelry making, but is passionate about fabric, fiber, and quilting. The tape measure ribbon she used is from Tim Holtz Ideology. Big Flower Buttons we have them in the poppy red that Hilary loves, also in Honeysuckle, matte frosted salmon pink, and crystal matte....and in two sizes! I got them JUST FOR the use Hilary has made of the poppy red example....as soon as I saw them, I KNEW they would make awesome focals. It is sold in three foot lengths. 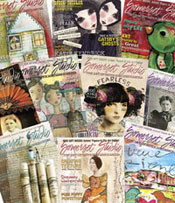 I might bring the Tim Holtz style in soon, too....I like the colorful graphic! Well, time comes when you have to put your kids on the school bus.... and send them off to school for the first time. Jordan is of the Alfred E. Neumann school of thought....."What? Me Worry?" So he will be fine! On May 14, 2011, Linda and Opie O'Brien will be teaching their Collage a Trois class at the Valley Arts Center in Chagrin Falls, Ohio. I would love to take it in full; I visited the class for a bit last May at Art and Soul. But this time....I am sending Jordan. It's time to take him off the shipping desk and let him find out about the creative process, and how to follow through. I can't think of better teachers to put him with....my favorites! http://www.valleyartcenter.org/ The spring teaching schedule is not yet published, but you can find a little info on the class at the O'Briens' blog, Burnt Offerings This class is a BUNCH of fun; you will make a wall hanging on a substrate, much as the O'Briens are famous for. You will need a deconstructed tin can (one with graphics), a tin type or a carte de viste (CDV) and found items. Jordan wants to take some old piano keys and metal parts off an old guitar....and call his composition, "Alicia Keys". We'll see how that works out! I told Linda, "Jordan's got all the crazy ideas in the world but no skills. Stick him in the back of the class and hope for the best!" I guarantee you, his life will never be the same after this experience....and he'll be begging for more! Have You Ever Wondered How to Get Your Work Published? But you'd like to take it to the next level and be recognized for your work, or share a project with a vaster audience. You'd love one of the crafts publications to publish your work. I will be the first to admit that I have never worked hard at doing this, my bad. The few times I have been published, I was approached and invited to submit something specific. It was always a great experience and I've been so thankful for the free press.....and I know that this is something I TRULY need to make time for, and make it happen! What hinders me most is time. There are stringent rules for submission, and each publication is different. Submitting does not by any means guarantee your work will be accepted; but most publications know that artists are busy and they do give you a good idea what they are looking for at any given time---so you don't have to guess. For example, STRINGING magazine does not accept techniques only; they like a finished project, usually bracelets, earrings, sets of necklace and earrings. There is even an email portal where you can send them a photo and query--which helps you to know what will work for them and what won't---and the editor, Danielle Fox is MOST gracious.....I will have to get that link for you later. But the fact is, if you can take the time, read the directions CAREFULLY and submit according to their rules, they will appreciate your efforts.....and if the work is well presented, you DO stand a shot. Want to be in Somerset Studio? Was one of your New Year’s resolutions to get published in 2011, but you aren’t sure where to start? Submitting artwork to Somerset Studio is really quite simple. We make the process fairly easy because as a submission-based publication, we love and need submissions! For Somerset Studio, we’re always looking for several types of submissions: responses to one of the themed challenges we’ve issued, technique articles, zines and art journals for our Melange department, lettering projects, and exemplars. Our list of themes and submission deadlines change with each issue, so it’s best to refer to the back of an issue or visit our Web site, stampington.com. Clearly label each piece of artwork with your name and contact information. Be sure this is securely attached to the artwork. Write brief instructions for each piece. Include a cover letter that provides your contact information and spotlights any techniques you may have used in creating your art. Include a check or cash to cover the return postage. If you’d like to receive acknowledgment of your art’s arrival, include a SASE postcard. Pack your artwork very carefully. Mail your package to us. Once the artwork arrives here, our Art Management team opens the packages and logs everything into a computer database. The artwork is then distributed by publication to each editor, and organized for art selection. Once the deadline for submissions has passed, all of the submissions for a given issue are laid out for art selection. A group of editors, designers, photographers, and the publisher then selects the artwork for an issue, sometimes directing pieces to one of our other 30 publications if we think it’s a better fit. Color-coordinating pieces: When picking artwork, we have to make sure the pieces will go nicely together. One question many people ask is why we prefer the physical artwork, rather than images. The photography for each of our publications is very distinctive, and without photographing things ourselves, it’s very hard to make the magazine cohesive. We are always willing to consider images though, so feel free to send them. If you’re still a little confused or have a few questions that I didn’t answer, you are always welcome to e-mail our Art Management Coordinator Michelle Nolan (mnolan@stampington.com). Christen Olivarez is Director of Publishing for Stampington & Company and Editor-in-Chief of Somerset Studio, the top-ranked magazine for mixed-media and paper artists. Her blog posts appear on CreateMixedMedia.com every other Tuesday. You don't EVEN want to know what it looks like outside my door this morning. Except that the sun is shining....hopeful. Yesterday about 2 in the afternoon, it started falling down in buckets....SNOW that is. Just that hard! This morning no one was able to get here til almost nine. Jordan's car is still sideways in the driveway. John's off from work as the schools are closed, so....he'll take care of it. Whew. One less thing to worry about. I don't even KNOW how much snow we got....at least a foot, with ice, too, and it's HEAVY stuff. I went out and tried to shovel a bit so they could get my Rendezvous out later to take the mail...wore my little self out. Is a little Garden of Eden. What a pleasure it was to spend quiet time by that pool, just looking at the lovely light and pondering. I'm finding that whenever I hit a rough spot in my day, I can close my eyes and dream of Costa Mesa. It has become my new special place. My dear family: cousin Kim, Aunt Milca, Mom (Lois, mother-in-law) John (the hub) and Uncle Fred. I love you! The Tea Lady Makes Jewelry! You've heard me go on and on about Kate Mulligan's hand-grown fabulous organic tea. Well, let me go on again!! She grows the herbs herself in Marietta, Ohio. Do you know Marietta? It's a great place. John and I went down there on a long weekend a coupla years ago....we had a ball going through all the little antique malls and historical places. There are a lot of great places to eat in Marietta, too. It's right down along the Ohio river....I really enjoyed it! Evidently, Kate sells her wares in a Farmer's Market on the weekends...shucks! I didn't even know there was one....I gotta go back. It's only maybe an hour and a half or two hours from here. I'll go this summer, and bring pictures back! But let's talk about that tea: Kate's is healthful and hand-crafted, all organic--no pesticides and nasty stuff! and, as often as we can! we send free samples of it with our orders, and have been, for a couple of months. She has partnered with me so generously to bring the tea to you. I can't promote this product enough! A good herb tea is a great detox, too. Sometimes we artists have to use products that are less than healthful. A good tea with antioxidants is a great way to keep those nasties moving out of your system. You can get MORE tea for yourself at http://www.OrganicTeabyKate.com.....and I hope you will. It makes a great gift, too! Kate prong-set a large emerald Bohemian stone and then glued small findings over top of it to accent it. I love doing this and have often done it over buff-top cabs (lower dome smooth top stones) but not over a faceted one. Her design really came out GREAT! But there's another idea for you.....take a plain stone and jazz it up by gluing pretty little charms over it. Kate apparently has also manipulated the findings to make them lie flat. A dear friend mentioned that in a message to me...her words, not mine....and they couldn't be truer! Really, a lot of us are worried about someone copying our work, our idea, our design. We worry about it so much that we hold back from sharing what we have done. We even worry about putting our things for sale on our websites for fear someone will come along and copy what we made. Some folks learn by copying someone else's work. Others lack their own ideas and are happy to take yours. What can I say? It's done. It doesn't feel good, especially when you see that someone has studied what you have done so completely, that they've practically duplicated it. Back in 2006, I decided to post my ideas IN THIS BLOG about Photographic Lens Jewelry. I had some art bubbles, was having fun, and hadn't seen this done with anything but an old watch crystal in some very funky art jewelry. The necklace using the old photograph was the focus of an article in JEWELRY CRAFTS magazine, as well. Ask me, though, how I felt when I saw how popular this idea got .....and left me in the dust. Hmmm. I was glad I sold them the materials.....and a little sad that I didn't have time to keep up. It's all good though, because my work was my work....and their work was theirs. And really...can I CLAIM that I was the first one to ever have this idea? Hardly! When we had the 300 piece line of jewelry that we made right here in the Messy Workshop, back early 90's, I trained quite a number of people to make my jewelry as well as the floral work I was doing at the time. And it would come out COMPLETELY different that what I had directed. So I realized right then and there, that everyone's concept is different, even IF they are using the very same components. Sure, if you are just putting a particular component on a chain with a bauble, yes! that could be duplicated easily. But that's why fashion is always changing, trends are always new---every season. Someone copies you? That's yesterday's news. Time to pull another rabbit out of your hat. You're done with that one, how many did you really want to make of that SAME thing, anyway? Let them have it, you're moving on. They can't copy what's inside of your creative heart....they can't see it...YET. Share what's in your heart, and don't be afraid.